Back and forth, back and forth, doing the Eden shuffle nine times in eighteen days, sailing across Twofold Bay every time the wind turned north to south and back again. Waiting, waiting, waiting; for that elusive weather window that could take us through Bass Strait. Then at last, after four weeks to the day in Eden, a sweet northerly looked to take us leisurely south to meet a mild cold front before the season’s first easterly was supposed to arrive. Hip hip hooray! A system that might take us all the way to Tassie’s west coast. But we’re we ready? Would our engine work be completed? 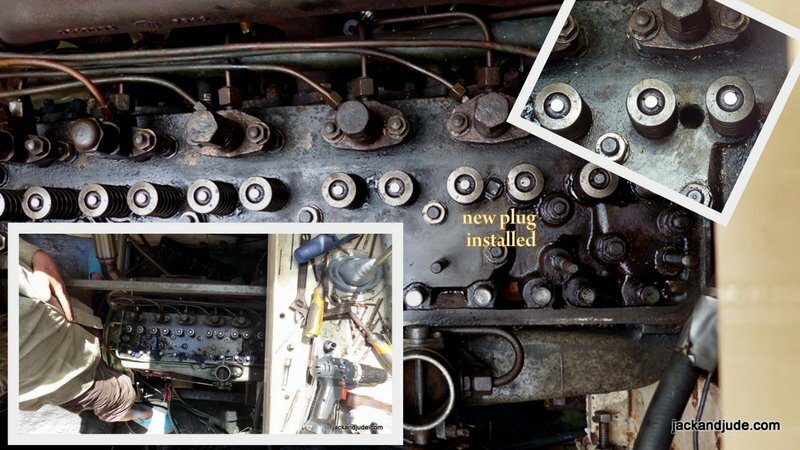 Just the day before the forecast winds, the engine cooling water leak finally was sealed. Then came the dirty chore of changing our polluted engine oil before refilling our donk with the good stuff, and then firing her up. Oh my, she sounded so sweet that thirty minutes of running at high speed seemed a fair test to prove that angels were smiling over our shoulders. 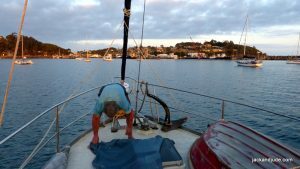 Wondering how far we’d get, “Good to go,” ran round’n’round our weary heads as we lay to rest before the marathon challenge of Bass Strait, east to west. 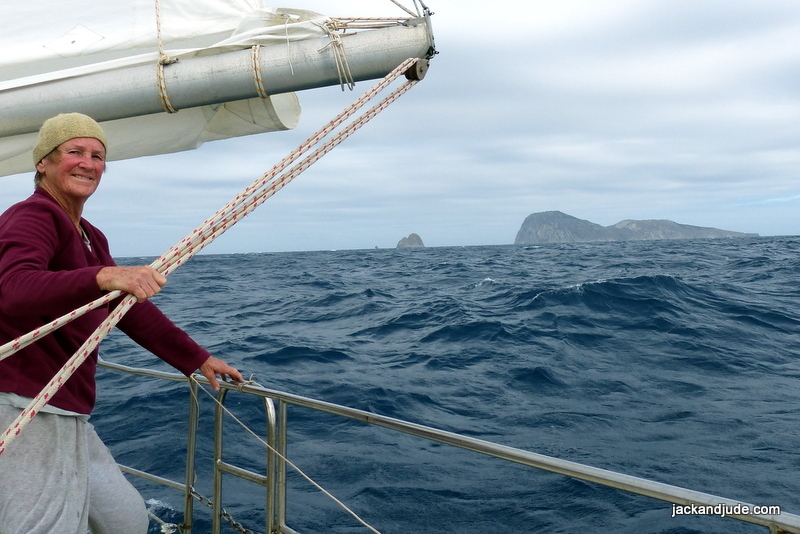 That Saturday sail away from Eden, past Green Cape and beyond into the Strait was nothing short of heaven. The vane steering our ship across easy seas left us at liberty to gaze upon the huge sand drifts draped over Cape Howe, the last sight of land before the blue abyss. 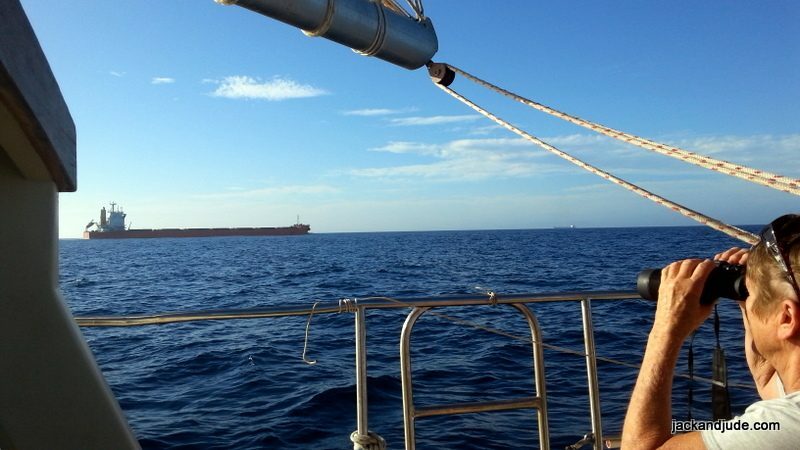 Those lovely breezes just kept going all that first night, giving us a wonderful sleep, to awake with land only faintly on the distant horizon while our ship continued to make miles south for a second day. Jude had just gone for her catch-up sleep when I spotted a spouting whale not far away. Humpbacks were still far away south, so I wondered, what was this giant critter? When it next breached, its blunt square head announced the first sperm whale I’d ever sighted, and now quite excited, I called for Judith to get up and come witness this wonderful creature. Together we stood as one as this magnificent animal came closer, expelling plumes of spray as it passed just metres astern. That’s when a new strange wonder was sighted. The tall sharp dorsal fin of an Orca tracked close alongside the sperm whale. Yet another scene etched into our lifetime memories. A journey through different wind systems is a treat even if a bit challenging. When the warm and cosy northerlies faded to stillness, we drifted upon a smooth sea, sleeping easy while waiting for the next system to find us early the third morning. Thick clouds announced its arrival. Followed by a few spots of rain heralding the coming headwinds, which were somewhat feared, not knowing if they would be a hissing pussycat or roaring lion. Becoming something in between, we sailed full and by the wind, north towards the dreaded shipping channel, not our desired direction. And when late that afternoon the leviathan steel monsters were threatening, we tacked back south to escape them. Then as the sun gave up the heavens, those mild headwinds left us to bob about like a cork on a ruffled sea. But Jude didn’t mind. She slept serenely in her bed while I kept a sharp lookout for the much anticipated east winds. Easy puffs, first this way then that, finally settled in from an easterly direction, forcing me to gybe our sails while Jude slept blissfully on. When we changed watch an hour later at midnight, the wind was rocking us along at fives, sixes, and sometimes sevens. Ready to be horizontal, I fell fast asleep swinging in my hammock, oblivious to all till a fuzzy light announced dawn of day four. Out the porthole, the towering heights of Deal Island were slipping past shrouded in a threatening mist that had me wanting to climb back into my snug warm bed. With the miles swiftly sliding under our keel, here came the stinger. 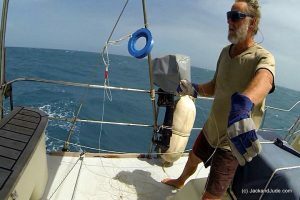 That much-awaited easterly flow just never stopped building, and by noon, I had to douse the mainsail, causing us to gyrate even more violently back and forth, side to side. But getting rid of that big sail allowed Sir Aries to steer our ship through seas growing steeper as our speed just kept getting faster. Now faster is better you might think, but not when a lee shore is quickly approaching while the already mighty seas are gaining strength. Every blast built more power into that mass that was then rushing towards the narrow gap we had to navigate in order to gain the safety of Grassy Harbour on King Island’s east coast. The wind had gone far beyond being a pussycat and was now shrieking through rigging like a tormented lion while bright white seas crashed down dark cliffs sending spray and spume flying. Our wheel spun lifelessly and sails flapped in a hullabaloo threatening to explode, shaking the rig, crying out for attention while we’re fifty miles from the nearest land at the edge of the much-feared Bass Strait. 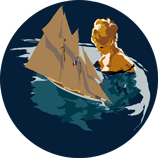 First priority; save the sails from shredding themselves, followed by a quick inspection of the steering quadrant aft in the lazarette. All okay there, both cables, just renewed, were intact around the turning blocks. Next came the tricky bit. With wet monsters rushing at us, I had to shimmy into a cockpit locker, torch in hand, to peer into the narrow space where the cables attach to the chain around the steering shaft. That coffin was actually rather calming with the B blown over at a steady angle and the noisy wind muffled. And so I lay there quite still, gathering my thoughts before pulling myself forward in that tiny space until I spied something I dreaded. Surprisingly, a newly crimped swage had let go! Finding the problem did not solve it. We were still at the mercy of wind and sea, miles from help; not that we wanted someone to rescue us. In fact, those miles of sea were a blessing because fixing the steering system would be far safer and easier in daylight. So, with the boat shut up tight, we both sat down and had a cuppa in the comfort of our now non-rocking galley. Lying ahull in fifty-knot gusts (100 kph) was actually quite comfortable. With all sails down and everything secured, the Banyandah laid over about 30 degrees and amazingly she lifted over the breaking seas – except once in awhile one would break on deck chucking mega litres of green sea into our cockpit. At first light, poor Jude, who’d had the watch, looked knackered and relieved when I reappeared from my rest back aft. Neither of us had slept. There’d been too much thinking about alternative destinations and plans for repairs churning through our heads. Jude couldn’t wait to put hers down, right there on the settee, and was out like a fallen champion, leaving me to shimmy back into that cockpit coffin to undertake repairs. Making a loop in the wire using bulldog clips was finicky, requiring extreme care not to drop a vital bit, but all went well. Then came the minutes of danger. I had to lift the dashboard to reattach the steering chain, exposing instrument and engine starting wiring. You can hear the really big ones coming. Most breakers swoosh down almost gently as they approach. The greenies don’t. They’re silent till they pounce. Then there’s a whoosh and physical roar. Only one defied my pleas, crashing aboard soaking me, but I ignored that as it’s just part of the job, instead being thankful that a wet weather jacket protected the electrics. So, after a few minutes reattaching the cables, I’d completed the task. Yeah! 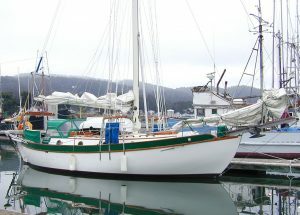 The Banyandah was ready to resume her voyage. But were we? In bright daylight, a few seas rushed past a full five metres high, instilling fear because so much power was heading straight towards our destination. Therefore, while Jude slept, I lay down and rested. 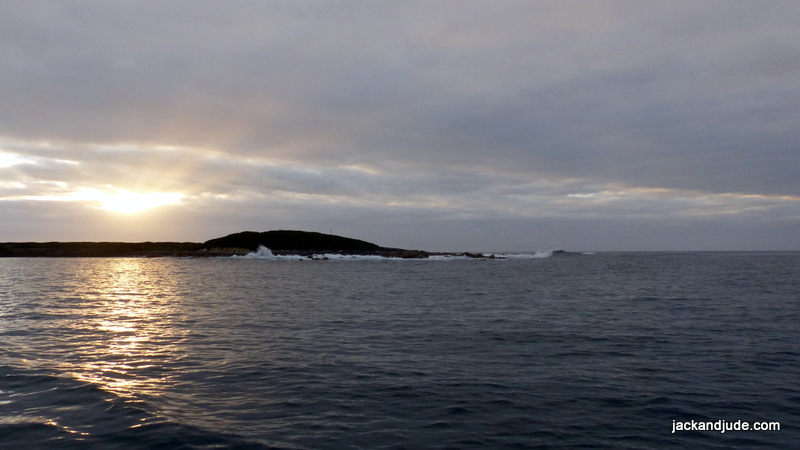 During our stormy night lying ahull, we had drifted fifteen miles towards King Island, now a dangerous lee shore. Communications were still poor even when using our broomstick antenna. Weather forecasts were not coming through, therefore after a few hours I tried texting a mate on the island, who miraculously responded. 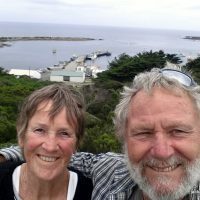 John and Lyn drove down to Grassy Harbour then text back that while the entry was confused, it was tenable. 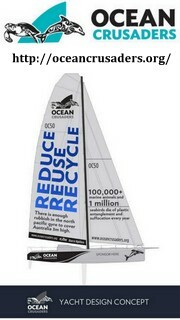 Heartened by that, at ten-thirty we unfurled a tiny sail to go have a look. And then as often happens, storms weaken quickly after passing and so by noon we were wing n wing with a staysail flying in a lessening wind that was backing north of east. 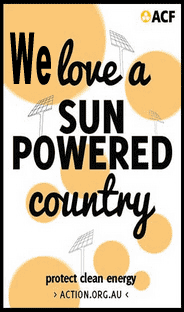 This should favour us when reaching the southeast corner of King Island where deep waters would swallow the swell and ease our entry into Grassy Harbour. 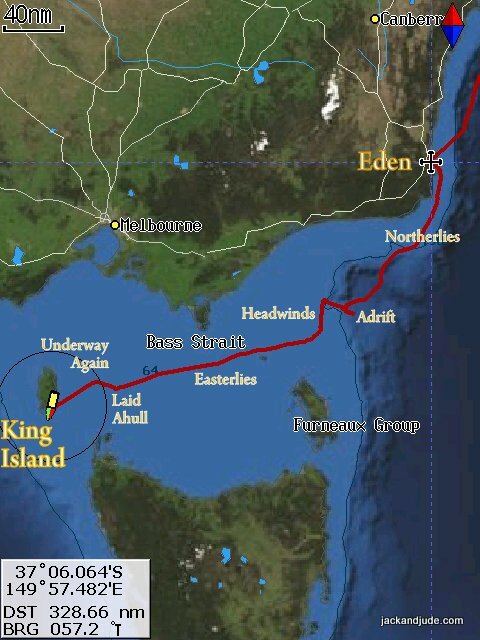 And so it passed that our journey westward through Bass Strait from Eden NSW to Grassy Harbour on King Island, logging 407 nautical miles, using three wind systems, twice becalmed, and lying ahull for almost twelve hours, took one hour short of four and a half days. Those stats hardly tell the real story of a journey always to be remembered for enriching our love of life with visions of Nature’s beauty and her wildness that strengthened our bonds even stronger. The wind we wanted came just after a week of recuperating with dear friends on King Island. 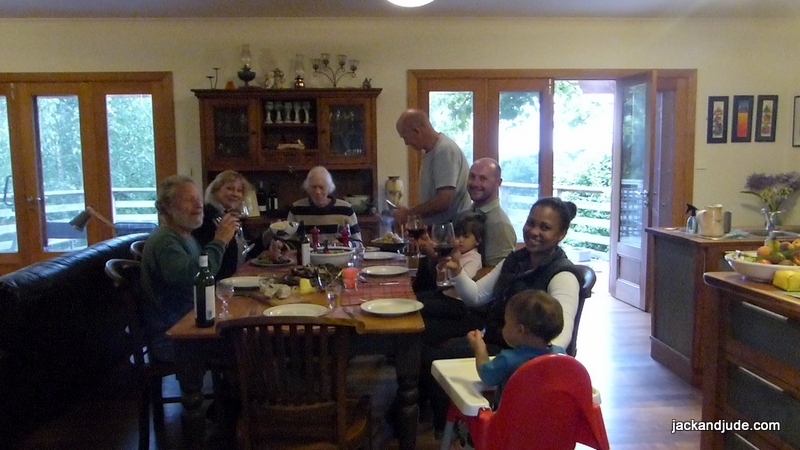 Much too soon we thought, but in this season of take what you can and be thankful for what you get, we enjoyed one last hurrah with John and Lyn, their son Byron and his wife Veronique and two lovely kiddies. 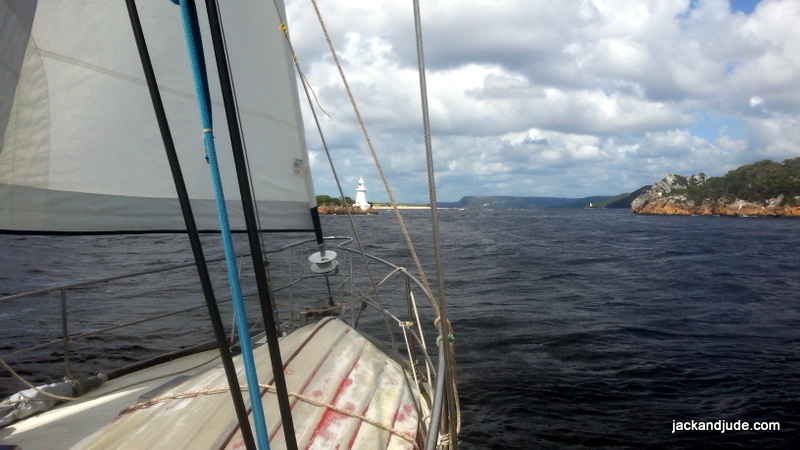 Then we came back to Banyandah to prepare for the sail down Tasmania’s most inhospitable west coast, of course on a westerly wind. To say we were apprehensive would be an understatement. 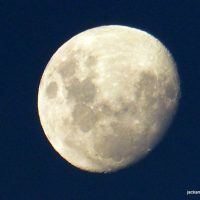 This year, the summer has not been “normal”. Blame it on President elect Donald Trump if you like. 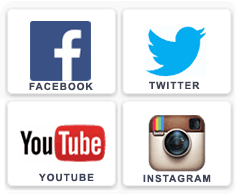 Our society is running amok, so why not the weather too. Our time on magical King Island was superb. Just what the doctor ordered after being blown to smithereens coming east to west through Bass Strait. 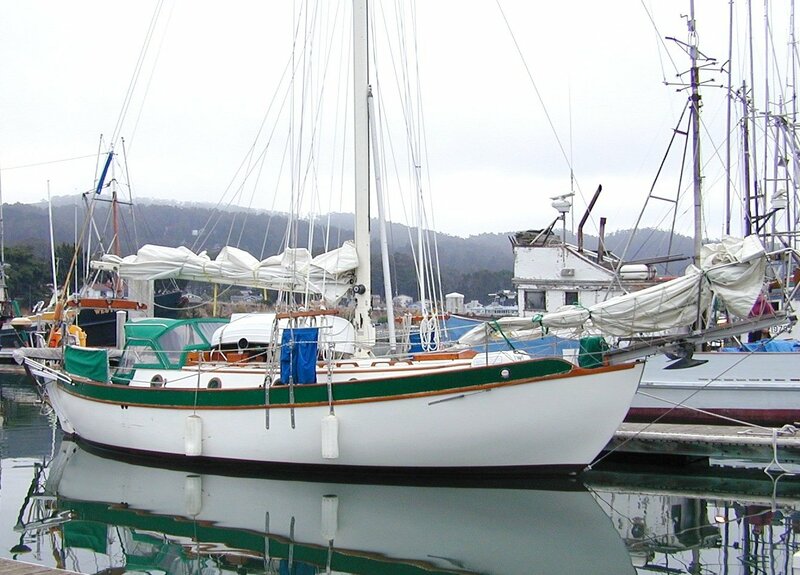 But more than that, we raised a glass or two in cheer with friends, and partook in the rebuilding of John’s dream boat, a wonderful Westsail 32. 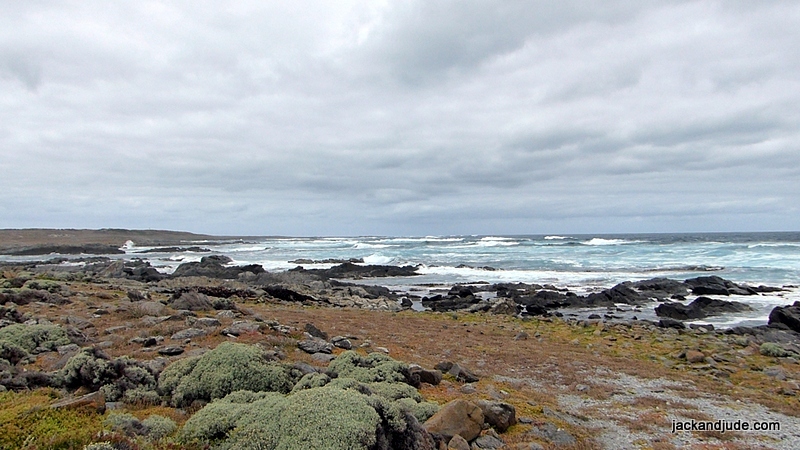 Then of course, we went off to reacquaint ourselves with isolated island magic, driving first to King Island’s southern tip to witness Nature’s awesome power breaking in spectacular fury on the lonely rocky shore. We also went in the opposite direction to the island’s far north where the tallest lighthouse in the southern hemisphere stands in testament to man’s selfish ego that extinguished 225 women and children’s lives. 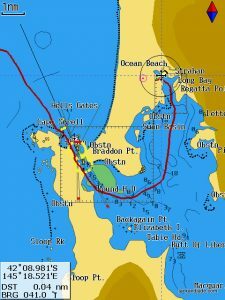 King Island lies in the western approaches to Bass Strait, an island steeped in nautical history, most of it quite tragic. 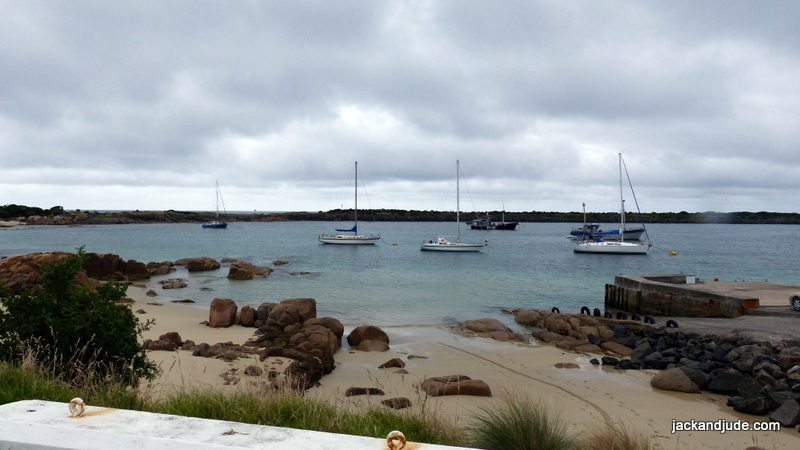 After Bass and Flinders discovered that Tasmania is an island, many captains risked the dangerous straits at their peril, because fog shrouded rocky King Island lay unknowingly right in their way. One of the most tragic shipwrecks, the Neva carried 240 people, most of them female convicts or the wives of already deported convicts and their children. 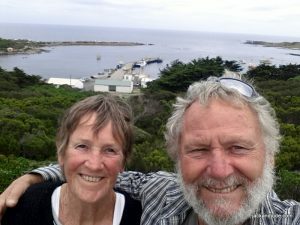 All were locked below when the ship struck reef a mere few hundred metres off King Island’s northern shore while the crew took the longboats to safety. 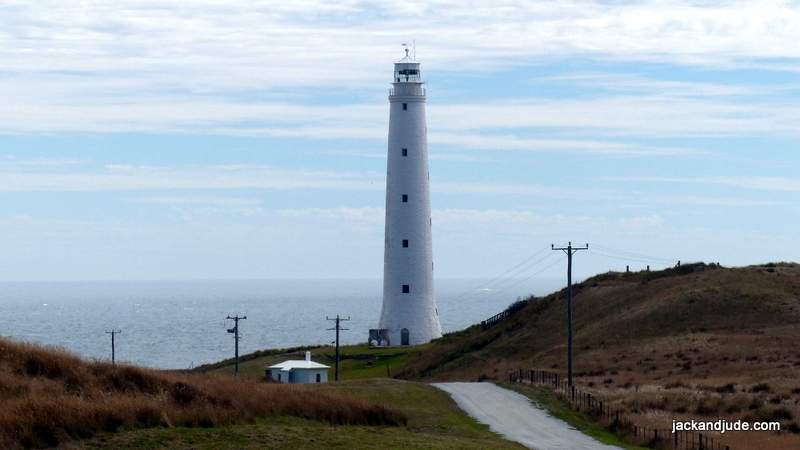 This so enraged the authorities that the Southern Hemisphere’s tallest lighthouse, standing 52 m high, was built within cooee of the Neva lying below Cape Wickham. 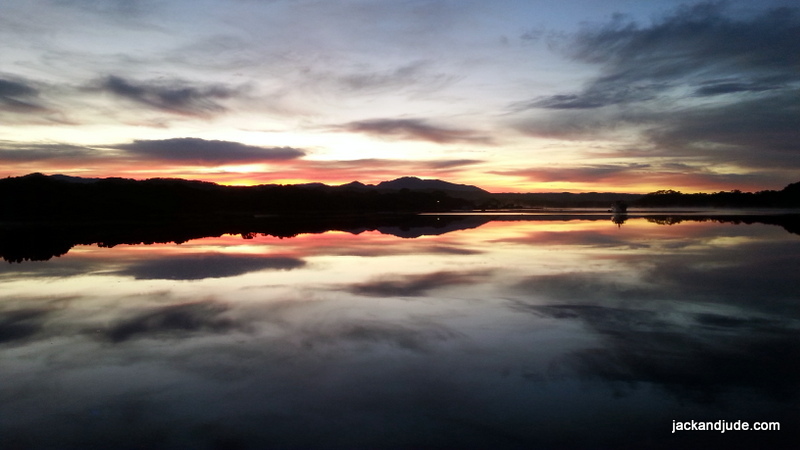 Situated halfway between the mainland and Tasmania’s north coast, the island is 64 km long and 24 km wide of gently rolling hills rising to 213 metres at Mount Stanley. 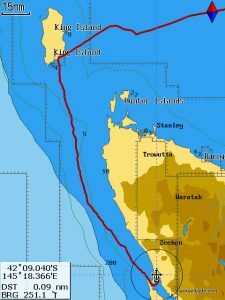 It was first sighted a few years after Flinders and Bass discovered Bass Strait, by Captain John Black, a privateer aboard the Harbinger who was taking a more southern route than the brig Lady Nelson, the first ship through the Strait. It was claimed for Great Britain in 1802, to prevent the French taking possession, and named to honour Philip Gidley King, the third governor of New South Wales. 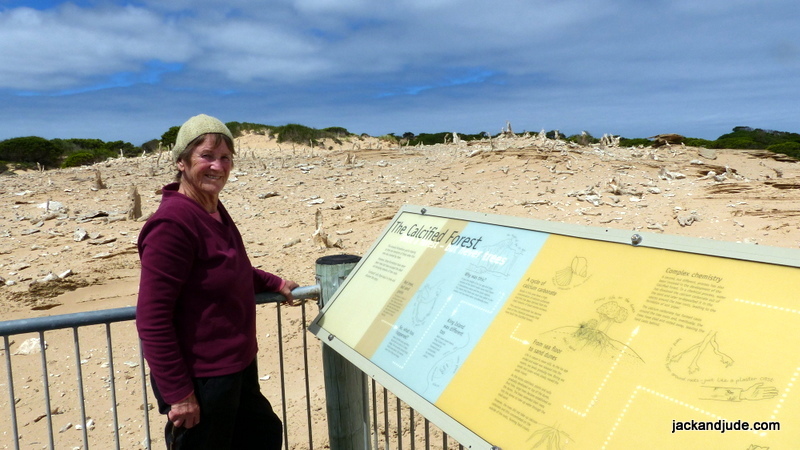 Lying directly in the path of the Roaring Forties, tourist pamphlets claim King Island is a land of long, empty beaches with numerous dairy farms, lighthouses, shipwrecks, and now two world-class golf courses. Its treacherous currents may have claimed hundreds of ships and far more than a thousand lives, but today it’s more renowned for award-winning cheeses, the freshest seafood and succulent beef. Some say the fine pastures were spawned by seed strewn from shipwrecked mattresses, but whether this is true, the island enjoys the cleanest air, ample rainfall and plenty of sunshine. The pace of life is far slower on Australia’s seventh largest island than just about anywhere else, and the locals – there are only around 2,000 of them – boast that the only traffic delays are from numerous wallabies, turkeys, possums and pheasants, to name a few. 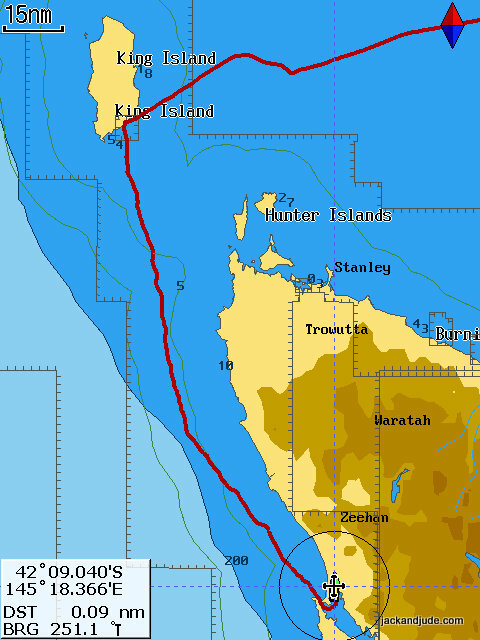 There are two all weather ports on King, the main one surprisingly on the west coast at Currie, which is the main town. It’s protected by offshore reefs that are a bit tricky to navigate in poor weather, meaning strong winter westerly winds and swell. The other port is on the island’s southeast coast at Grassy. On a Friday, a bad luck day to start a voyage say the old timers because statistically more ships are wrecked on Fridays; nevertheless we were up at first light under a cool, totally overcast sky threatening all kinds of disasters. Fortunately, we had the benefit of three different weather forecasts telling us all would be okay if we went that day. 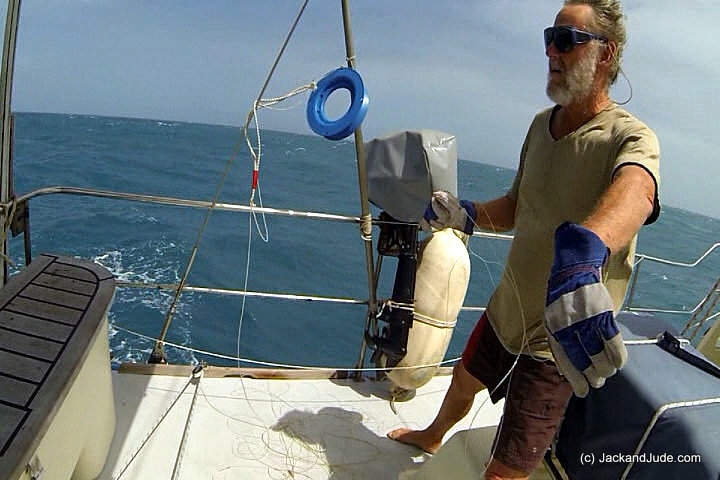 So, with our sick engine sounding somewhat recovered, we uncovered our sails and slipped the mooring. Then our journey began by navigating between the inshore reefs to deepening open water where we found the breeze we wanted. Silencing the noisy machinery brought instant relief, leaving us to revel in the rhythm of swell in concert with a beam wind filling our sails. Nothing compares to being lifted by hidden forces while propelled and accelerated atop waves. Jude, as usual, wanted to helm our ship. 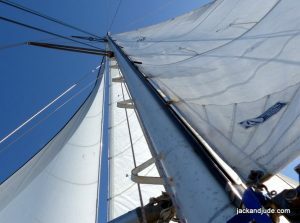 She delights in controlling such immense power while I simply like to lie back and watch her work the wheel as she checks the compass and plotter, and occasionally cast an eye skyward to our wind sock atop the mast. When she tired, it was my turn. I engaged Sir Aries then fiddled with the weather helm bias on the tiller to give him the best chance to steer us straight across a sea that varied in power and height, complicated by a wind that never seemed to be constant. While doing this at the rear of our ship, a young seal popped up to say hello before diving across my trolling line, only to pop up again alongside, where it raised a flipper as if greeting another sea creature. 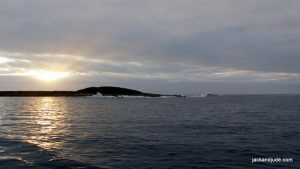 Between King and Hunter Islands lay many obstructions such as Reid Rock, Albatross Island, and Black Pyramid, home to over 12,000 pairs of Australasian gannets, the largest colony in Tasmania and about 20% of the world population. A lot of current runs through this obstacle course, making the seas rather a mess. Tossed about we just had to endure the sometimes violent motion, best accomplished when lodged solidly in a corner, or lying horizontal. A trade off is, we went fast. So fast, in those first few hours, I thought we’d arrive off Hell’s Gate before sunrise and shortened sail to slow down. Ah! But the wind gods had other ideas. As the day wore on, the wind became fickle. Clouds appeared. Rain drops fell, causing the wind to rise and forcing us to readjust. But after the clouds had passed, taking the wind with it, we stalled and wallowed, until, after a period of time the whole process began again. All the time, out of the west rose a fairly big swell created by some far away storm. Huge ridges of sea charged at us, and after miraculously lifting us, we’d fall into a canyon. Sometimes as they came upon us these powerful walls broke into cascading white water. Some even chucked a tanker full of green water upon us. That’s west coast sailing, and just part of the job if visiting this amazing area of Earth. 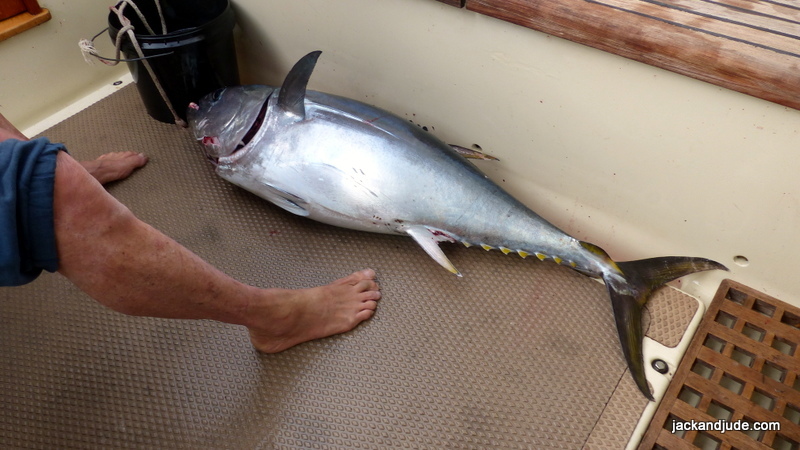 There’s always plenty of Nature in our faces when 20 miles offshore Australia’s biggest Island, where early on we hooked what must have been a pretty big fish. So big, we left it on the hook to tire itself before we did battle. But after an hour of swimming to keep up, the lucky fellow somehow got itself free. Not for long were we fishless, for later that first day, his brother or cousin or uncle hit our lure and wham, the line groaned out bow string tight. Bigger than the first, with darkness fast approaching we figured we’d better haul this one in, painful as that might be. Back aft, braced into my position against the life raft, I began hauling in the first eighty metres of light braided cord using the sea’s motion, fast during the lull after we’d surge and holding steady during our rush. But when I reached the heavy monofilament, the new gloves I wore slipped, giving my fingers a painful slap whenever the metal swivel snapped back against them. So, there we were, Banyandah racing along unattended, me restraining a powerful beast while Jude rushed to find the leather gloves, putting each on a hand as it could be made free. As if the break had giving the beast a ray of hope, then the real battle began. 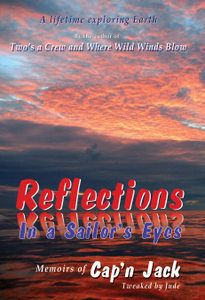 Rotating my shoulders and using my torso, soon its silvery shadow came racing, zigzagging through the depths behind the boat. 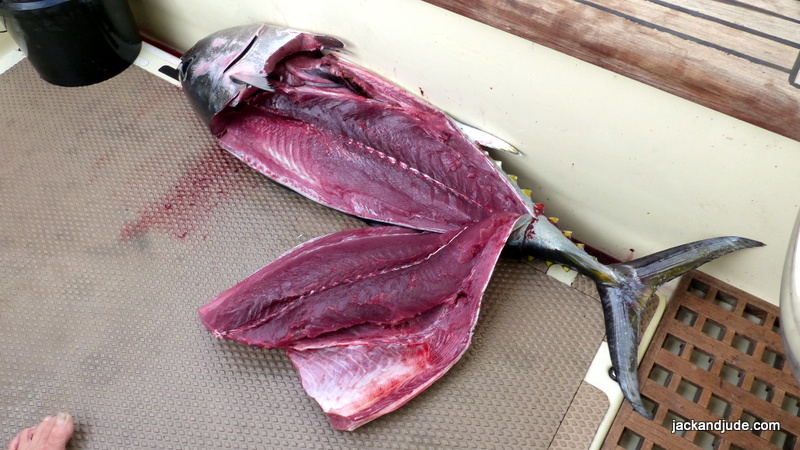 Once alongside, seeing how huge the creature was, we wondered how we’d haul it on board, especially as we were gliding through the water at sixes and sevens. Our routine is; I pull the beast forward alongside to the cockpit, with Jude right behind, gaff in hand. She’s the one that has to strike the blow. Well! That’s the plan. 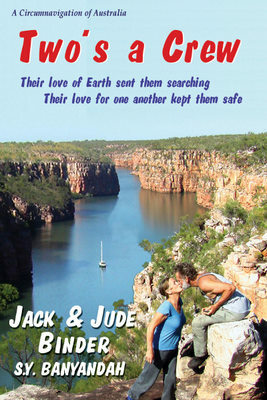 How it works is subject to variables, such as how big the critter is, how well Jude plants the gaff, and, how wild Banyandah is cavorting through the water. This one was way too big for Jude – or even for me to lift. But we’d hooked it, so we must make use of the creature. This time the whole drama exploded when Jude actually gaffed the fellow first hit just as the hook flew out its mouth. Suddenly the magnificent beast was free, except for a bloody big hook in its belly, which I grabbed in a rush of exuberance charged by adrenalin. 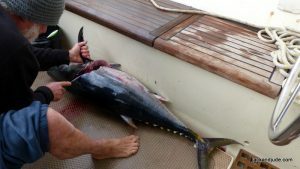 Neither of us is out to needlessly kill a beast, but for tucker we had to land this animal and butcher it, else it would be lost to the oceans, which we know will remain spotless as nothing there goes to waste. Determined not to lose a huge feed, I manoeuvred the gaff into the open access below the railing then heaved like there was no tomorrow. Yes I’m part caveman and often blinded by the need to get something done. Stunned by being harpooned, the beast came out of the water rather quietly as Jude reached through the opening to grab a fin then together we gave an almighty heave. Guess the ship must have rolled because I fell backwards, lost balance and crash landed on the cockpit floor, the beast following. Gory, yes, but we must eat to survive. So if you cringe, just imagine what happens to all the meat you eat. Humanely killed might be said, but dead nevertheless and cut up into pieces. Well, that’s what happened next. I quickly dispatched the animal then had to butcher the beast in our rocky-rolly cockpit. We harvested all its meat, cut it into steaks that were packaged like the supermarket would and then chilled, ready to give to some of our mates in Strahan after we made landfall. For we are hunter-gatherers when the opportunity presents itself, providing tasty sustenance for many in our clan, and if the world wasn’t so over crowed with humans, there would be heaps and heaps of beasts again, and the few taken would not threaten their existence and I’d not be bringing this up. Cleaning up took place as night revealed a heaven alive with stars twinkling in the brittle cold air, the far horizon holding the only smudge of cloud. At midnight, we switched watch again and I put in a second reef in the main. Not that the wind had increased, just in case it did as I wanted an unbroken sleep. 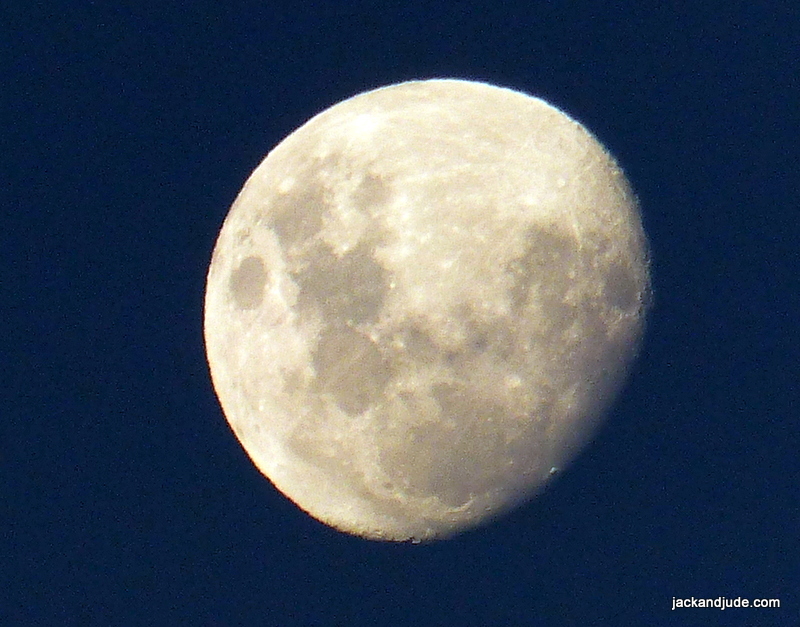 Wrong again, about 3AM the wind eased and with so little sail aloft, I had to get up to raise more to steady us. 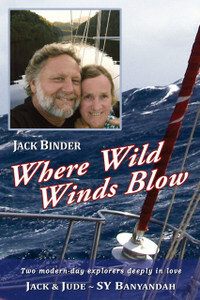 Sailing the wild seas is often challenging. Most of the rest of this story is anticlimactic because the wind eased further, even if the giant southern ocean swell did not. So, at first light, we now worried whether we’d have to battle an immense breaking sea when entering Hell’s Gate. Needless worry really. 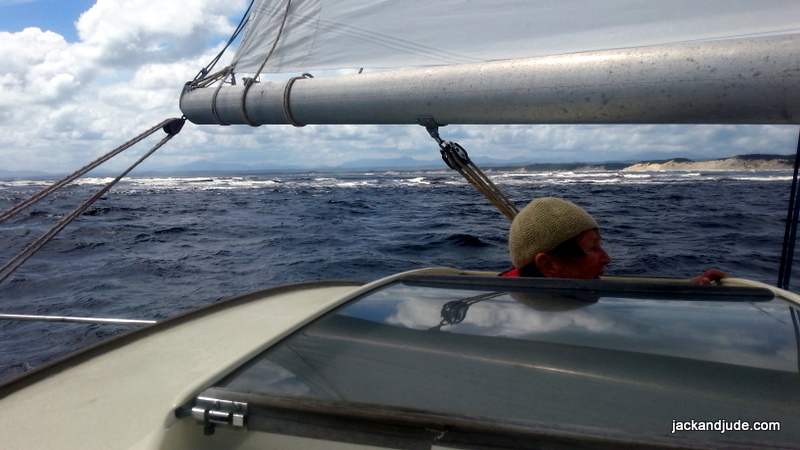 Cape Sorell does a fabulous job of blocking westerly swell from the gate, and so in we came under full sail, the engine ticking over just in case something should go awry. Just past the training wall, a mammoth sea breaks on abrupt Kawartiri shoals that have claimed many a ship including stricken steamer Kawatiri on 18 August 1907. In fact, the best part of the whole darn voyage was sailing through narrow Hell’s Gate while being hardly arrested by the usual outpouring of river water. And then being propelled by an increasing wind all the way through the shoals and into the harbour, right up to the entry into Mill Bay where we have a mooring. Gosh, it’s so still here. The quietest we’ve been since leaving our river two months ago. And the scenery, we’d forgotten how awesome are the mountains and glorious colours reflected by the mirror sheen waters in the silence. It’s such a relief to be home again.